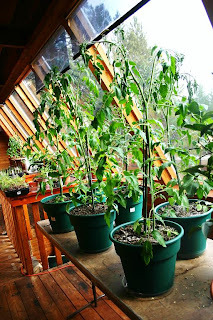 The tomato plants in the solarium are getting huge. It's time to prune these monsters, but we hate the thought of doing it. I've been researching the pruning of tomatoes to make sure that we don't kill off our babies, but most of the information is on pruning to improve fruiting not pruning to control the height/size of the plant. Any ideas out there? The railing in our upstairs solarium makes a really great place to place trays of seedlings. 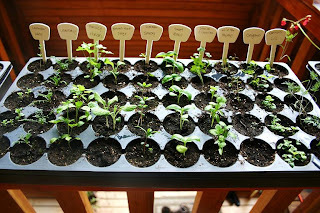 Above is a tray of lupine, followed by some herbs, onions, shallots and leeks. Beyond that are some more tomatoes and peppers. These herbs will be used as ornamentals (and also for harvesting) in the bed in front of our house and in the 8x26 foot raised perennial bed in the garden. This is my first try at growing chamomile. It seems to be quite a thirsty plant and not too attractive. Definitely won't grow this indoors in a pot again. 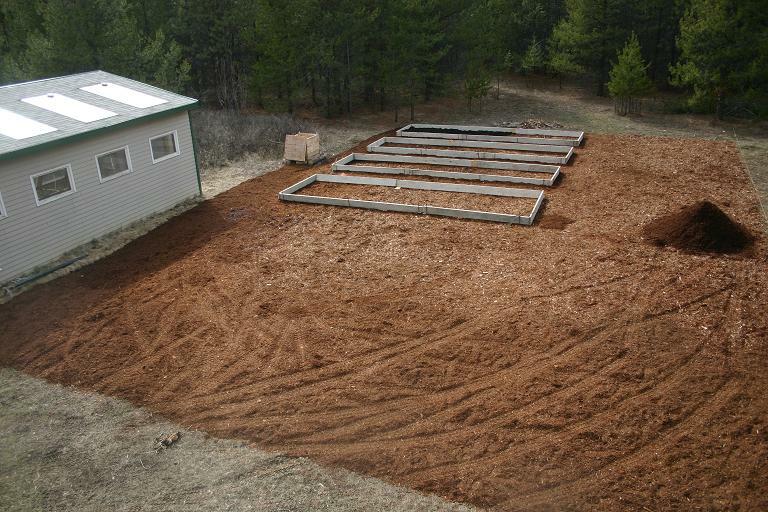 This picture was taken 2 days ago of the progress on the garden. Ta-dah! Today we finished moving mulch. 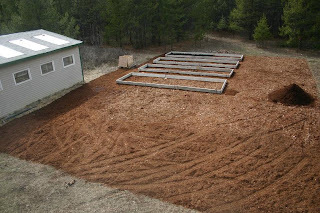 We have a small pile left to move for leveling. 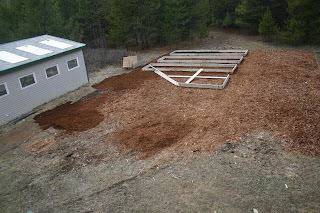 We calculated that we've shoveled/spread roughly 80 cubic yards of mulch. Thank goodness it's free. This has been a 6 month project interrupted by snow and soggy ground. 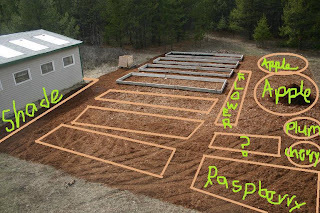 Eventually there will be 7 raised beds running parallel to one another, a raised bed against the greenhouse for a shade garden, a raised bed on the other side of the 7 parallel beds for flowers (bee food!) followed by a row of fruit trees with some beds of berries on the bottom right corner. We're definitely growing raspberries, but we were advised to not try blueberries or grapes at our local extension office. Any ideas for some other berries to grow? We're a zone 3/4. As soon as we finished the mulch, we started looking at another garden spot for future expansion. 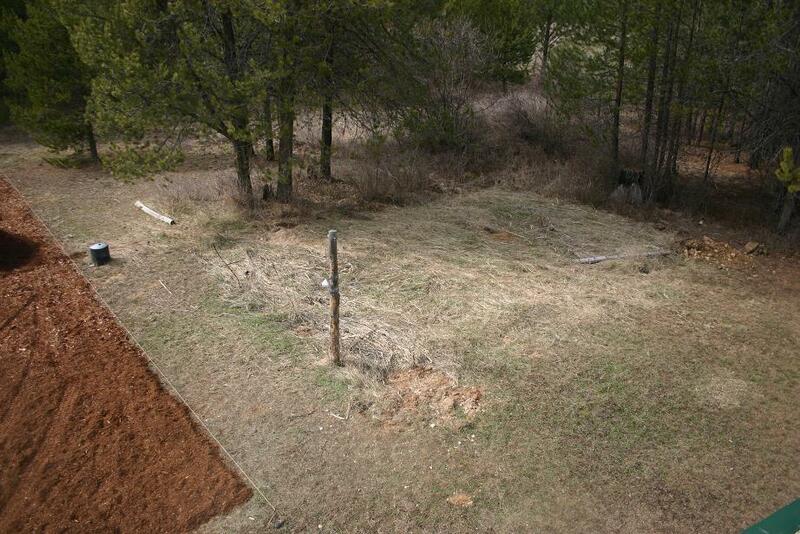 You can see where the previous homeowners had their garden. Much smaller, at maybe 20 by 20 feet. 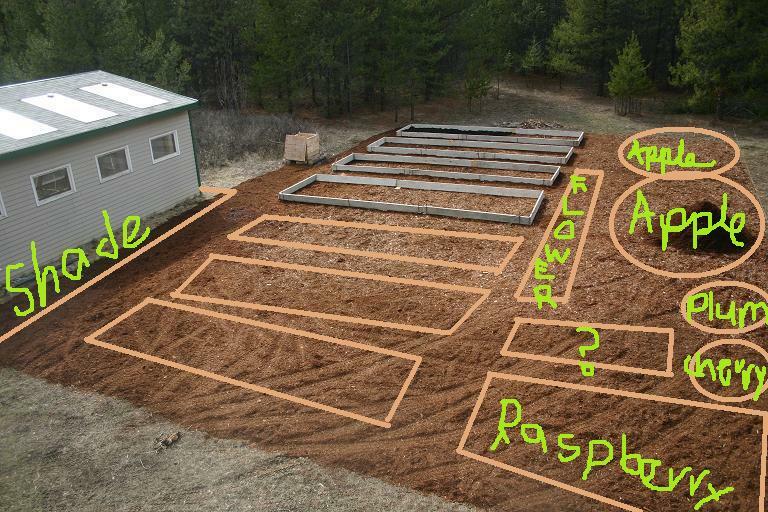 We're thinking of creating a berry patch here in the future. 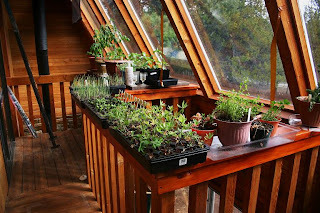 Now a look inside the greenhouse. The radishes in the greenhouse are getting closer to harvesting. Maybe another week or two? 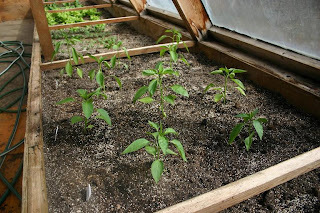 We transplanted some peppers to the greenhouse this weekend. The minimum temperatures are regularly between 35 and 39 degrees. I know this is a bit chilly for peppers so we've only transplanted out 1/3 of the peppers. The rest are relaxing in the solarium enjoying balmy temperatures between 55 and 100 degrees. 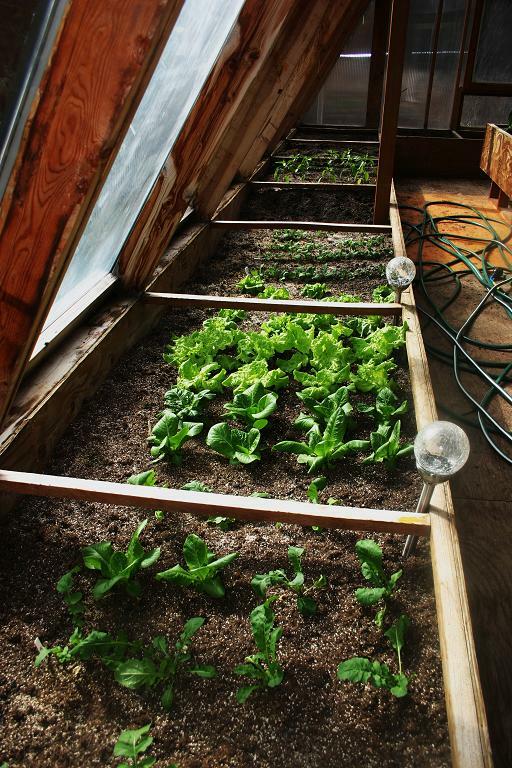 The south bed in the greenhouse containing arugula, winter density lettuce, black seeded simpson lettuce, radishes and then the peppers. Next time I plant arugula I'm planting 4x as much and only leaving a few inches between plants. I love this stuff! We never ate much of it before as it was always so expensive in the grocery store. The greenhouse tomatoes are holding their own despite a slightly chilly week. 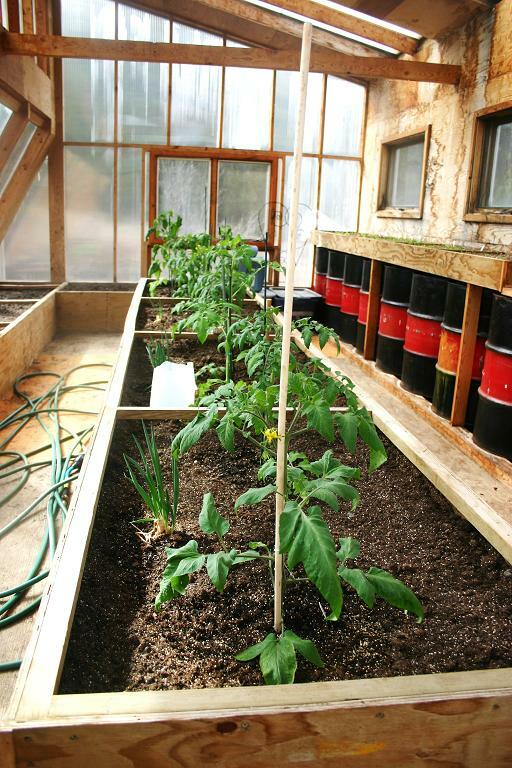 In the foreground is a brandy wine tomato, followed by a greenhouse type hybrid, debarao tall vine and then a few more brandy wines. They've also been joined by some creeping onions that a coworker gave me. 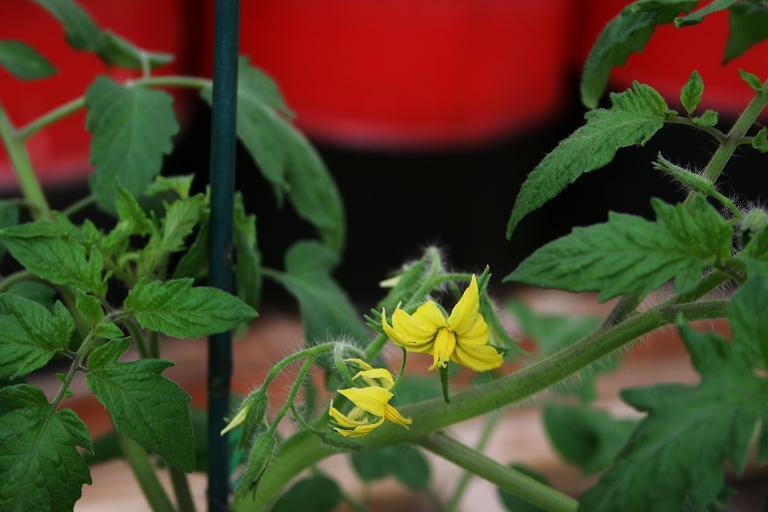 All of the tomato plants are flowering! We have been busy going around and making sure that everything gets pollinated. 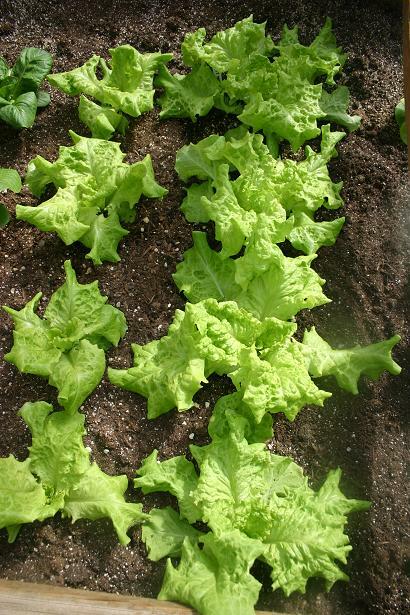 Hopefully this black seeded simpson lettuce is ready to harvest soon. My tomato plants are similar in height. But I’m not planning on pruning them yet. I prune only those leaves that are growing between main branch and a leaf. I will start to prune my tomatoes in May, when I transplant them in the garden. Garden will look lovely. Do those trees in the back make shade for the garden? 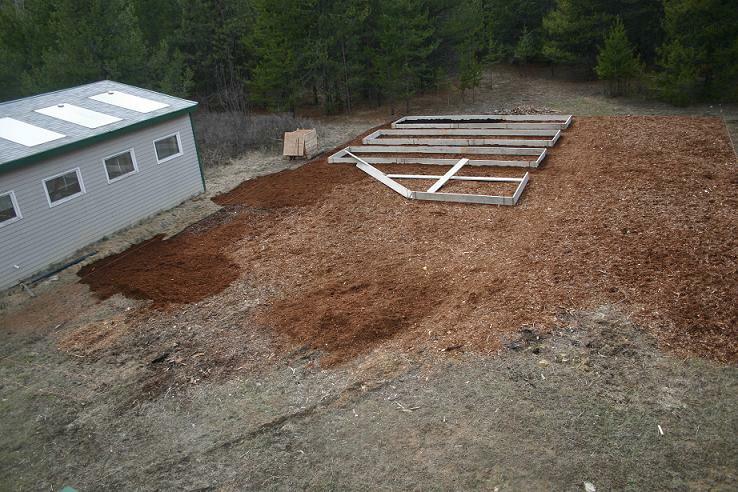 Looks like you are really making progress, the mulched area is huge! Possible berries might be currants and/or gooseberries, another possibility could be hardy kiwi. I would call and talk to the folks at One Green World (www.onegreenworld.com and 877-353-4028) about fruit suitable to your growing conditions. This nursery is located in Oregon and might be familiar with growing conditions in your area. 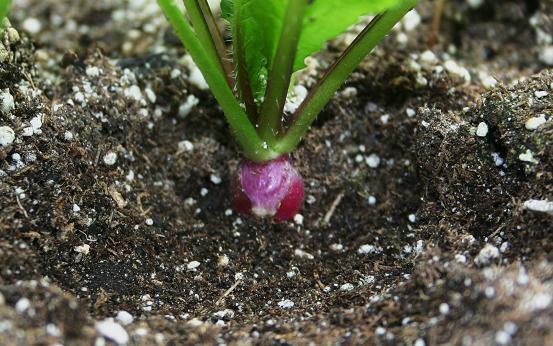 You should also consider the soil pH and late spring frosts to figure out what would thrive. 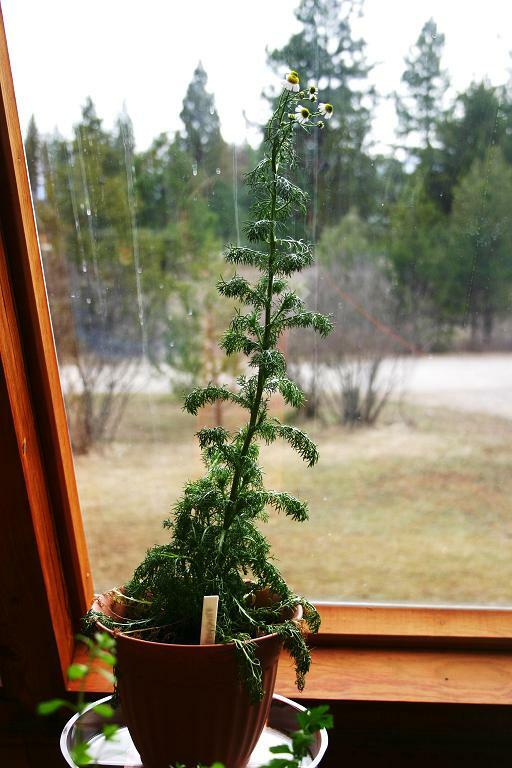 I saw in their catalog that they had pine trees that produce pine nuts and 2 varieties are very hardy. On pruning tomatoes, I do know that you can control the height of indeterminate plants by top pruning them, but that is usually done when they are around 4' tall. They will then put their energy into producing growth and fruit below. I would be hesitant to do such pruning on a determinate type plant though as their growth is already somewhat limited. I will be curious to see what you decide and how it works out. vrtlarica: Thanks for the input. Pruning the side shoots seemed to be the most common way of pruning tomatoes that I've read about. We're not so concerned about the size of the greenhouse tomatoes, its the ones in the solarium that are about 4 feet tall right now. The trees in the back are on the Northern side of the garden, so they should not make shade. Mom: I'll give them a call. We would LOVE a pine nut tree in the yard. Hmmm... pesto. Mr. H: These are all indeterminates, I think it might be time to top prune a bit and get the side shoots. Wow! You're really moving along! I keep expecting to see flowers on our tomato plants, but not yet. An update on fruit/berries: we placed our order for berries, we got heritage and fall gold raspberries, 2 types of honey berries and currants. We also just ordered our fruit trees - apple, pear, plum and cherry. 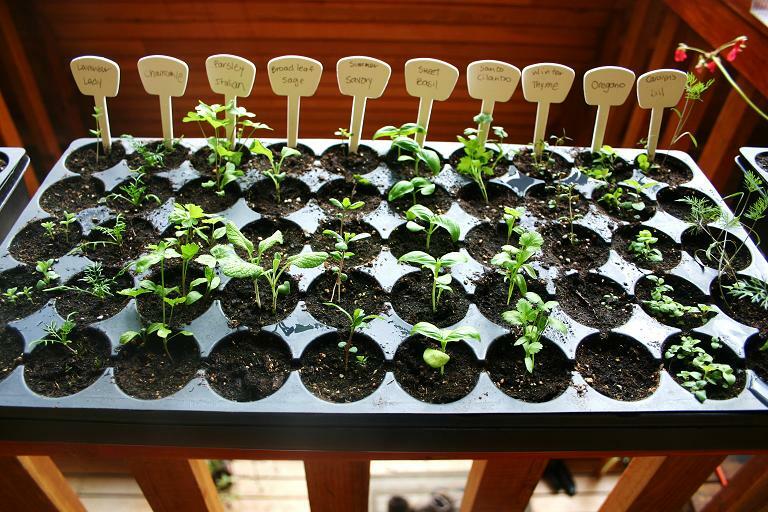 We can't wait to plant all of these.